The deck you can take with you! A beautiful mini-tarot deck from the artist and spiritual director of The Institute for the Development of the Harmonious Human Beings, E.J. Gold. The original deck was handmade in his studio. It is designed to help you strengthen your intuition, hear your soul's messages, connect with your purpose and light up the world with your presence. 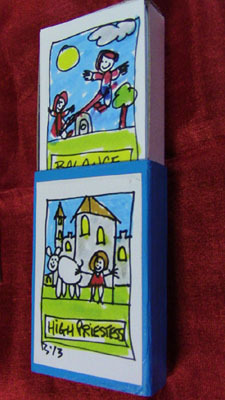 These miniature cards 1 7/8" by 1 1/4" are printed one side. 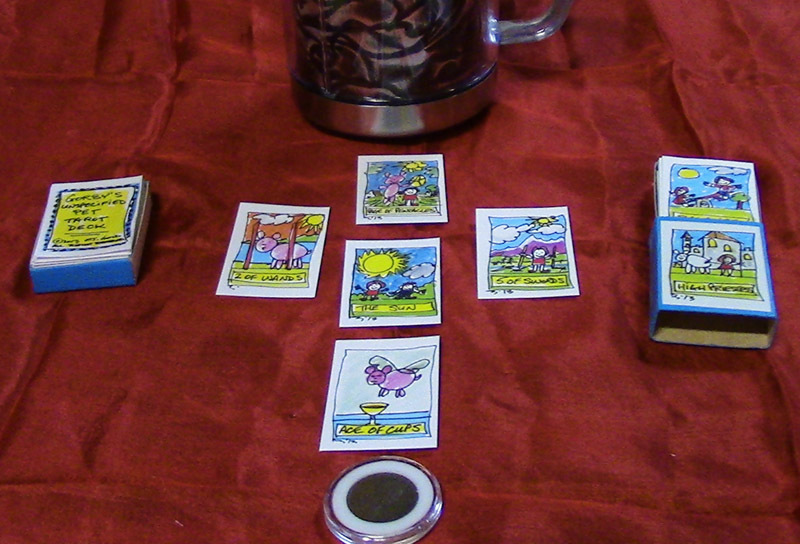 The deck is a licensed miniature reproduction of "Gorby's Unspecified Pet" tarot deck, published in 2013. E.J. Gold creates the cards as eyeball friendly as possible because each card is a memory aid to help you remember exactly what that card represents. 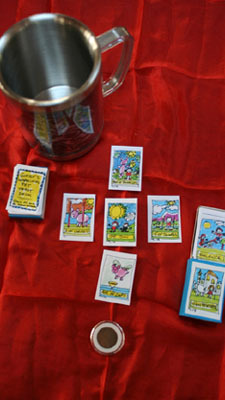 These cards are endowed with the Magician's Magic. 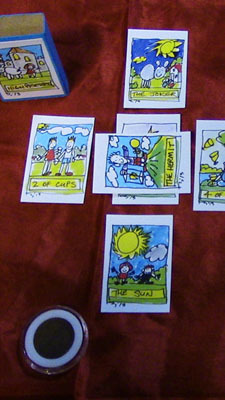 "The cutest ever tarot deck! My kid style drawings are colored with bright primaries and secondaries -- it's electric and as I said, cuter than ice cream on apple pie!" "You can learn to use the tarot as a tool of guidance, as a tool of initiation, self-revelation and self-study, because it is a tool for self-study. You can learn a lot about yourself, by using it as a revelatory tool, a tool that will help trigger of revelations for you." "The card is there to remind you that a type of situation is present at that location in the reading and active at that point in the reading. The cards are your 'reminding factors' -- when you look at the card in a particular position, get a sense that it is just one piece in the big puzzle."